Beginning in the late 1990s and early 2000s, state officials began to realize that their traditional "pay-as-you-go" approach to funding to build new roads was no longer able to keep pace with the state's highway needs. A combination of increased population, a surge in interstate and international trade, a sudden dramatic increase in construction costs in the early 2000s, and the increasing effects of inflation on the state's static fuel tax, which was last adjusted in 1991, were taking a toll (no pun intended) on highway revenues. Additionally, improved fuel mileage, which translates into less fuel tax paid per mile driven, as well as the legislature's diversions of funds from the state's Highway Fund to pay for non-transportation budget shortfalls, were also substantially cutting into the amount of funding available for transportation. Furthermore, the federal fuel tax, having not been adjusted since 1993 itself, was also suffering from inflation-induced depreciation. As a result, the federal government in 2008 and 2009 was forced to rescind previously allocated funding to the states due to those shortfalls in expected revenue. Texas and San Antonio have historically been shortchanged on transportation funding and a substantial backlog of needed projects remains from all those years of being shortchanged in addition to the demands caused by recent explosive population and traffic growth. Meanwhile, until recently, the state's funding issues had only been addressed by the Legislature through a series of small band-aid measures and Congress continues to struggle to fix transportation funding issues on the national level even after promises by the current administration to aggressively address infrastructure funding. Therefore, to help expedite the construction of needed roadways, the legislature-- and, subsequently, voters-- approved bonding and tolling to pay for new roadways in 2001. To help back some of that new debt with a sustainable revenue source, the Texas Transportation Commission in 2003 directed that all freeway projects be evaluated for toll worthiness and constructed as toll projects if they were deemed viable. Additionally, the state encouraged regional authorities in the early 2000s to develop local funding mechanisms to help augment state funds. To that end, Bexar County leaders in 2003 created the Alamo Regional Mobility Authority (ARMA) to take a local leadership role in finding funding solutions for the San Antonio area. Because there are few local transportation funding options available under state law, the primary focus was on using tolls as the backing for bonds that would fund major projects. Tolling the new roadways and lanes would provide the funding mechanism to pay for them in lieu of waiting for limited tax-based financing. It was projected that using this financing method would allow many major projects to be built as soon as 25 years ahead of the traditional gas tax-funded schedules and, as a result, also substantially cheaper. Although created primarily as a tolling agency, ARMA has actually been able to secure non-toll funding sources for all of the projects it has developed, most notably the US 281/Loop 1604 interchange, which was originally expected to be a toll project. During its session in early 2015, the Texas Legislature approved a new funding source for highways that will allocate approximately $2.5 billion from sales taxes and motor vehicle sales taxes annually to highways and also ended most diversions from the Highway Fund. It is expected that this increase in funding will allow all local previously-planned toll projects to be built without the use of tolls. As there are currently no more active toll projects planned for San Antonio, this page now describes the history of local toll proposals. Some people have the perception that implementing a tollway on a road means adding tolls to an existing roadway. However, this is not possible under state law. So in all cases, toll road projects involve the construction of new roads or new lanes on existing roads, almost always some form of expressway lanes. Below are the different types of tollways that have been considered for Bexar County. In this scenario, the mainlanes of the expressway, which are new, are tolled, while the access roads remain toll-free. The expressway lanes include overpasses at major intersections (i.e. no traffic signals.) It is important to understand that in every case where this type of tollway has been proposed, it was essentially the same proposal as a non-tolled version of the same project would have been. The only difference is that drivers who opt to use the new expressway lanes pay a toll. The existing toll-free, signalized lanes remain toll-free and serve as the frontage roads for the new expressway lanes. This is a more "traditional" type of tollway such the Sam Houston Tollway (Beltway 8) in Houston or George Bush Turnpike in Dallas. This type of tollway was planned for part of US 281 but dropped when new funding became available in 2015. It had been studied for the Kelly Parkway, a possible future extension of SH 151 outside of Loop 1604, for Wurzbach Parkway between Blanco and Wetmore, and for a section of Bandera Rd., but those proposals were subsequently dropped. Number of lanes can vary depending on project. Diagrams are for illustrative purposes only and are not to scale. In this type of project, on roads that already have non-tolled expressway lanes, those existing lanes remain toll-free, but new tolled express lanes known as "managed lanes" (see definition below) are built in the median between the existing toll-free expressway lanes or, in some cases elevated over or depressed below the existing lanes. The existing lanes may have to be moved or reconfigured to provide sufficient room for the new lanes. When built at-grade, the managed lanes are separated from the toll-free lanes by barriers with limited entry and exit points to the toll-free lanes. Examples of this type of tollway are I-10 West (Katy Freeway) in Houston and the North Tarrant Express in Ft. Worth. This type of tollway was planned for part of US 281 but dropped when new funding became available in 2015. Elevated tolled managed lanes were also proposed for I-35 North but were dropped in mid-2018 and the new elevated lanes will now consist of toll-free general purpose lanes and HOV lanes. Managed lanes have also been proposed at times for parts of I-10 West, I-10 East, Loop 1604, SH 151, and I-37, but Loop 1604 is the only remaining active tolled manage lane project at this time. What is a managed lane? A managed lane is a lane where the operational strategies of the lane are adjusted in real-time to ensure that the lane remains free-flowing, thus providing for a guaranteed travel time for users of the lane. For example, toll rates or vehicle occupancy requirements may fluctuate based on traffic conditions or time of day. Typically, managed lanes allow toll-free access for buses, carpools, and emergency vehicles while single-occupancy vehicles (i.e. solo drivers) can use the lane by paying a variable-rate toll. How is this beneficial? Besides providing a clear way for public transportation and emergency vehicles and encouraging carpooling, it also gives solo commuters who want or need to get where they're going faster an opportunity to bypass congestion by paying a toll to use any excess capacity of the lane. Every motorist who opts to do so removes one more vehicle from the toll-free lanes which can help ease congestion. The resulting toll revenue helps to subsidize for the road, saving scarce tax dollars for other needed projects. In this plan, new direct-connect ramps between intersecting roadways (tolled or toll-free) are tolled. 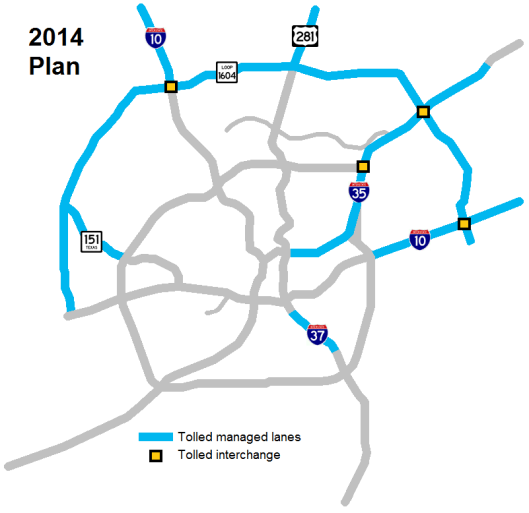 Tolled interchanges are currently proposed as part of the Loop 1604 managed lanes project. Tolled interchanges were also planned as part of a managed lane project on I-35 North, but that project has since had its toll component dropped. A tolled interchange at US 281 and Wurzbach Parkway was studied but determined to be infeasible. Other tolled interchanges were previously proposed at Loop 1604 and SH 151, Loop 1604 at I-10 East, and on the planned Kelly Parkway at I-35 and at Loop 410. The US 281/Loop 1604 interchange was initially planned as a tolled interchange but various other funding sources allowed it to be built with non-tolled connectors instead. In 2009, ARMA identified a number of feasible tollway projects in Bexar County. An initial "starter system" of about 20 miles along US 281 and Loop 1604 was originally identified with additional segments of Loop 1604 subsequently added. Several other possible toll projects had also been investigated by TxDOT but were subsequently determined to be infeasible. The map below shows the proposed tollway locations in San Antonio in that 2009 plan. Wurzbach Parkway from Starcrest Dr. to Blanco Rd. In the years between 2009 and 2014, ARMA and TxDOT continued studies on the various corridors and made revisions to their list of possible toll projects. In December 2014, the MPO incorporated the latest proposals into their plans as shown on the map below. I-37 from SE Military to Fair Ave. In late 2007, the MPO approved toll rates of 17 cents per mile and 57 cents per tolled interchange ramp for most passenger vehicles. Larger vehicles (such as 18-wheelers) would pay 46 cents per mile and $1.15 per ramp. As was the new trend across the US, all tolls would be collected electronically; there would be no tollbooths. In electronic tolling, tolls are collected using an electronic transponder ("toll tag"). These tags are stickers mounted inside the windshield of the vehicle that contain a radio frequency ID (RFID) chip that transmits the tag's unique code when triggered by electronic tag readers located at strategic locations along the toll system. These readers then record the identifier codes of tags as they pass by and the toll is deducted from a pre-paid balance in the account associated with tag. Alternatively, vehicles can use the toll system without toll tags; the license plates of these vehicles are photographed and the vehicle owner billed by mail for the toll amount plus an additional collection fee. The toll tag systems across the state are interconnected, so toll tags from any Texas toll agency can be used on any tollway in the state. In addition, Texas' toll tag system is interoperable with several other states. After the new state funding legislation in 2015, full funding was secured to build the US 281 North and I-10 West segments without tolls. Both included HOV lanes instead. The SH 151, I-10 East, and I-37 segments were also subsequently switched to non-toll funding sources. That left the I-35 North and Loop 1604 (Bandera Rd. to I-35) expansions as the last remaining local toll projects. After further evaluation of expected revenue, the diminished value of the remaining projects due to the lack of a larger system, and a push by state leaders starting in late 2017 to deprecate tolling, local officials decided in 2018 to nix the remaining local toll plans, first for I-35 North, and then Loop 1604. This completed the dismantling of the local toll plans. Separate and unrelated to the above plans, the Cibolo city council instructed city staff in 2015 to investigate options to extend FM 1103 south to FM 78 and I-10 and a blue-ribbon citizens committee was formed to study the matter. In 2016, that committee recommended the project go forward as a tollway. This project is independent of the plans above and has no involvement from TxDOT or ARMA. More information on that project is here. Plans to create local toll roads got underway in 2003, first with the creation of ARMA and then when the Texas Transporation Commission (TTC) ordered that "controlled-access mobility projects in any phase of development or construction must be evaluated for tolling. This includes new-location facilities and increased capacity projects such as adding additional main lanes or constructing new main lanes." (TTC Minute Order 109519, 12/18/03) The order specifically included "increased capacity projects such as...constructing new main lanes." These two events kickstarted the local effort to create a regional toll-funded transportation plan. In late 2003, TxDOT was working to secure funding for a planned expansion of US 281 from Loop 1604 to Stone Oak Pkwy. Because that project fit the requirements of the TTC order, TxDOT was compelled to evaluate it for possible tolling. That review showed that it was viable for tolling, so per the TTC's order, the project was reclassified as a toll project. A plan to expand Loop 1604 was also evaluated for tolling and subsequently combined with the US 281 project to form a tollway "starter system" plan. Initially, the plan was that TxDOT would build the starter system beginning in late 2005, then transfer operational responsibility to ARMA when completed around 2009. But in May 2005, Cintra-Zachary, the private consortium selected to build the first leg of the now-defunct Trans-Texas Corridor, made an unsolicited bid to build and operate the San Antonio tollway starter system. After review, TxDOT decided that the proposal had enough merit that it would have to be considered, and in accordance with state law, accepted other private bids to build and operate the starter system. According to media reports, Cintra-Zachary's bid would allow the project to be built faster, would pay the state a concession fee in return for a 50-year lease to collect the tolls, and because it was privately funded, would allow TxDOT to reallocate the $600 million that it would have used to build the starter system to other projects. After a bit of rancorous debate between TxDOT and ARMA, it was agreed that the private plans would be evaluated with local input. After word of the toll projects became public, a substantial amount of grassroots opposition, headed by the Texas Toll Party group that had also vehemently opposed Austin area toll projects, started to form. They showed en masse at an MPO meeting in mid 2005 and managed to get the proposed Loop 1604 West project tabled, at least for the time being. As one might imagine, these events added some uncertainty to the entire project. However, TxDOT awarded the construction contract for the US 281 North tollway (Sonterra to Stone Oak) in September 2005 and preparation work for construction began in December 2005. The opponents filed a lawsuit shortly thereafter challenging the project, arguing that it required a full (and costly) environmental impact statement (EIS) instead of the numerous environmental assessments (EA) that had been performed up to that time. Federal law only requires an EIS to be performed if an EA finds significant impacts, which the EAs for 281 did not. 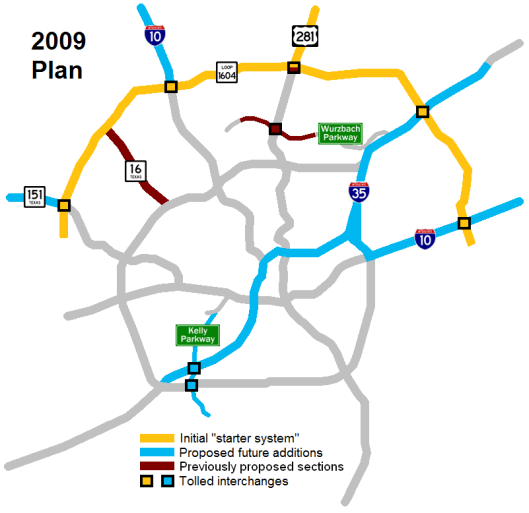 However, TxDOT and the Federal Highway Administration (FHWA), who were both named in the suit, jointly agreed in January 2006 to suspend work on the 281 tollway project as well as a separate overpass planned at 281 and Borgfeld so that a comprehensive and definitive EA for the entire corridor could be done and a subsequent determination made of whether a full impact statement would need to be performed. In early 2007, the new EA for 281 was released. As with previous assessments, it found no substantial issues, a so-called "Finding of No Significant Impacts" (FONSI). The FHWA approved the EA in August 2007. TxDOT announced plans to cancel the overpass project at Borgfeld as ARMA indicated it was considering building the entire 281 tollway project from 1604 to Borgfeld as one project with construction possibly beginning in 2008. ARMA also completed studies on other possible toll projects on I-35 North, Bandera Road, and Wurzbach Parkway. In early 2007, ARMA determined that the Wurzbach Pkwy. proposal was not feasible for tolling. The tolling option for the Bandera Rd. project was dropped by the MPO board in October 2009. TxDOT announced in mid-2006 that it was considering possible toll lanes along I-10 West from Loop 1604 to Boerne and I-10 East from Loop 410 to Seguin. Those would be new managed lanes in the median; the existing lanes would remain toll-free. Subsequent proposals for the I-10 project pulled-back the northern endpoint-- at least for a first phase-- to Leon Springs. On June 11th, 2007, after a series of discussions with the Legislature, Governor Perry signed compromise legislation that put a two-year moratorium on the construction of privately financed toll roads. The bill included a number of exceptions, mostly in the Dallas-Fort Worth and Houston areas; the 281 and 1604 toll projects in San Antonio were not exempted. Consequently, on June 15th, ARMA voted to assume control of those projects with plans to fund the projects with toll-backed bonds and begin construction in mid 2008. In late June 2007, TxDOT released the results of the EA for the Loop 1604 managed lanes and expansion and showed plans for the proposed improvements. That EA also had a FONSI outcome. However, with the threat of legal challenges looming, ARMA decided to move forward with a full EIS for Loop 1604. That study has experienced a number of scope revisions and funding challenges and is currently on hold. In December 2007, the MPO approved the toll rates for the US 281 project. ARMA announced that they would build the 281 project in two segments: Loop 1604 to Marshall Rd. and Marshall Rd. to the Comal county line. Construction on the first segment, from Loop 1604 to Marshall, was expected to start in mid 2008 with completion in late 2010. The second segment was expected to be completed in 2012. In February 2008, toll opponents and environmentalists once again filed a lawsuit challenging the comprehensive 281 environmental assessment. After initial arguments, the judge ruled that the plaintiffs' case had sufficient standing to move forward with discovery. During the discovery process, TxDOT announced that they found a document that had been inadvertently omitted from the administrative record for the environmental assessment and asked for a 60 day stay to allow time to submit the document to the FHWA for review to determine if it would change the overall findings of the study. In early October 2008, TxDOT then reported that they had uncovered a conflict of interest with the contractor who had performed the endangered species portion of the study. Specifically, it was discovered that a TxDOT staff biologist was married to an employee of the company hired to do the a portion of the study. It was further discovered that the TxDOT employee's supervisor was aware of the situation and allowed it but that controls put in place to mitigate the conflict were not enforced. Although it was determined that this likely had no impact on the results of the study, TxDOT asked the FHWA to revoke their environmental approval for the project to preempt the inevitable legal battle. Subsequently, the defendants (TxDOT, ARMA, and the FHWA) agreed to do a full environmental impact statement (EIS) for the corridor and the lawsuit was dismissed as moot in November 2008. In April 2009, ARMA hired the consultant to develop the new EIS. In the meantime, while the legal challenges had been working their way through the system, ARMA had hired Cibolo Creek Infrastructure Joint Venture in May 2008 to design and build the 281 project. The consortium was headed by Fluor Enterprises of Irving, Texas, and Balfour Beatty Infrastructure Inc. of Atlanta, and included several San Antonio subcontractors. (Contrary to pervasive public perception, this consortium-- unlike the Cintra-Zachary group-- included no foreign companies.) Design work was 30% completed when it was stopped in late 2008 due to the aforementioned litigation and subsequent decision to do a full EIS. ARMA had planned to start construction in late 2008 or early 2009 on the first segment, from Loop 1604 to Marshall Rd., with estimated completion in late 2010. However, those plans were scrapped pending a new project to be recommended by the environmental impact statement process. In December 2014, the MPO approved an updated plan that included the previously-planned managed lanes on US 281 North and Loop 1604 as well as newly-proposed managed lanes on I-35 from downtown to FM 1103, I-10 West from Loop 1604 to Boerne, I-10 East from Loop 410 to SH 130, SH 151 from Loop 410 to Loop 1604, and I-37 from SE Military to Fair Ave.
During the Great Recession, Congress approved a national economic "stimulus" plan that poured additional federal money into road construction projects. In February 2009, the Metropolitan Planning Organization (MPO) approved allocating San Antonio's share of transportation stimulus funding to be used as matching funds to leverage state funding for the first half of a 281/1604 interchange. This project built all four of the ramps connecting 1604 to 281 inside the loop, i.e. northbound 281 to both directions of 1604, and both directions of 1604 to southbound 281. The use of the federal funds allowed the ramps to be toll-free. The Texas Transportation Commission (TTC) approved the funding request on March 5th, 2009. Construction began in early 2011 was completed in mid 2013. It was determined that the ramps connecting to 281 north of 1604 could not be built until the lingering issues stemming from the lawsuits and associated environmental studies for 281 north of 1604 were resolved. However, funding was identified for those ramps so that construction could begin as soon as the legal and environmental issues were resolved. In May 2012, local officials announced they had identified funding to construct freeway lanes on US 281 from Loop 1604 to Stone Oak Pkwy and on Loop 1604 from Bandera Rd. to Wiseman Blvd. The working plan for US 281 included two to three toll-free freeway lanes in each direction and one or two tolled managed lanes. The managed lanes would include direct access to a park and ride facility being planned for the corridor. It was hoped that construction would begin sometime in 2014 or 2015 once the ongoing environmental study of the corridor was complete and approved and barring any further legal challenges. Over on Loop 1604, plans were announced to build two toll-free expressway lanes in each direction from Braun to Potranco with room left for future toll lanes (essentially a southward extension of the existing freeway configuration at Bandera Rd.) once an environmental study was complete in 2015. Additional plans were being developed to add managed toll lanes to the existing non-toll lanes on Loop 1604 across the northside. In January 2014, TxDOT and ARMA announced funding had been secured to expand US 281 from Loop 1604 to Borgfeld Rd. using a mix of non-tolled and tolled/managed lanes. Some funding would come from traditional tax-funded sources with the remainder coming from bonds backed by toll revenue. Funding was also allocated-- mostly from a City of San Antonio bond issue-- to complete the northern ramps for the Loop 1604 interchange; as with the previously completed ramps in the interchange, these new ramps will also be non-tolled. With funding now in hand for the entire corridor, construction was expected to start in late 2015 or early 2016 contingent on the approval of an environment study that was scheduled to be complete in mid 2015. The funding for 281 was part of a larger financing package that included funds for proposed managed lanes on I-10 West from Loop 1604 to Ralph Fair Rd. and for non-tolled expressway lanes on Loop 1604 from SH 151 to US 90. In the summer of 2015, TxDOT submitted and the FHWA approved the completed environmental impact statement for the US 281 project. Then, during its session in early 2015, the Texas Legislature approved a new funding source for highways that will allocate approximately $2.5 billion from sales taxes and motor vehicle sales taxes annually to highways. During the summer of 2015, several local officials indicated that should voters pass the new financing and the expected funding then be allocated by the state, efforts would be made to remove the toll component from the US 281 project. In early September 2015, the MPO approved a resolution to that effect and the Texas Transportation Commission approved the funding change later that month. In November 2015, voters approved the new funding source and officials announced shortly thereafter that the plans for 281 would be updated to remove the toll component with an expected groundbreaking in 2017. The Loop 1604 and I-35 projects, because of their scope and expense (nearly $1 billion each), were still being planned as toll projects. In late 2017, the governor and lieutenant governor directed the TTC to remove (or at least discourage) tolling from future projects. However, because Loop 1604 and I-35 were already in the local plans with toll bonding underpinning their funding and because the new state funding for the area was still projected to be insufficient to cover their cost, they retained their designation as toll projects; this was required in order for planning on the project to continue. With tolling now deprecated and with all the other planned local toll projects converted back to traditional funding, the MPO in 2018 decided to remove the tolling from the last local projects that included it-- first I-35 North and then finally Loop 1604. For more information on the history of the US 281 project and the current expansion projects, see the US 281 North Expansion Project page. For more information on the history of the Loop 1604 project and current plans, see the Loop 1604 North Expansion Project page.